Main courses and side dishes are needed. We have ample salads and desserts - no further are needed. We'd like to know in advance what you will bring to share. April 15 is the final date for reservations. Please email Adrienne at asbrowning1@gmail.com with the number of people attending and the type of dish you will bring to share. $10 per person will cover the cost of the room rental, wine & disposables. Your secure payment can be made on the ABOUT page of our website - DONATE. Questions? Contact Adrienne at asbrowning1@gmail.com. This year, Purim is Wednesday evening and all day Thursday. We will gather and share breakfast and Hamantaschen and then around 10:00 am we will read the Book of Esther also known as the Megillah. Afterwards, we will hit the slopes together and catch a few drinks after our day of skiing. Join us for latkes & pizza! 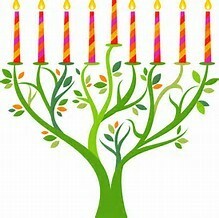 Bring your Chanukah Menorahs to light as we recite the blessings as a community. Join us for homemade latkes (potato pancakes) and the story of the miracle of Chanukah. In memory of the 11 people killed and those wounded at the Tree of Life Synagogue in Pittsburgh, together we mourn and remember the lives lost. Together as a community, we come together to show solidarity against hate. All are welcome to come and express their thoughts, emotions and prayers as a result of this senseless act of violence. Join us in the Sukkah as we shake the lulav and enjoy a festive meal. To mark the end of the harvest and the end of the agricultural year, please bring a canned good to place in the Sukkah. At the end of Sukkot, we will donate all canned goods to the Telluride Food Bank. In order to cut down on plastic and other trash, we encourage you to bring your own plates and utensils to reuse and/or recycle. In addition to the children's Sukkah decorating and cooking project, the community is invited to help decorate the Sukkah prior to our Supper in the Sukkah. Please NO perishable items due to the abundance of bears in town. Note: Sukkah decorating will take place on Wednesday, Sept. 26 prior to our Supper in the Sukkah on Thursday, Sept. 27. Please let us know the number of people attending and the type of dish you will share with the Telluride Jewish Community and our surrounding neighbors. Join us as we walk to the falls by the Town Park campground and cast our sins (breadcrumbs and/or rocks) into the depths of the water. Try out your shofar blowing ability with others from the Jewish Community. We will engage the long standing Jewish tradition and text of spiritually readying ourselves for our annual encounter with ourselves, our loved ones and with God. In lieu of tuition, please make a donation to the Telluride Jewish Community High School Essay Scholarship Fund. Held in private home in/around Telluride. Held in private homes in/around Telluride. Registration is limited to 20 participants. To register & location information, email tuvyah@eitzah.org. Pot Luck Dinner ~ Please bring a dish of your choice to share, but NO pork or shellfish, or meat dishes mixed with dairy. RSVP by July 23: guntdar@cox.net with your attendance and the type of dish you will provide. Call Linda at 480.390.8200 with questions. Please join us for a traditional Telluride - Passover "Pot Luck" style Seder Feast and reading of the Haggadah with the Telluride Jewish Community at the Telluride Community Room, 231 E. Pacific Ave., Telluride, CO 81435. Please email Adam Dubroff at adubroff@gmail.com for more 2nd Seder information, to reserve seats, "pot luck" items, pitching in on costs, etc. Join us for a traditional Passover Feast and reading of the Haggadah with the Telluride Jewish Community. Celebrate the Jewish holiday of Purim by decorating hamantaschen (triangular shaped cookies) with your family and friends at the Wilkinson Public Library. Join us for latkes, pizza and sufganiot! Bring your Chanukah Menorahs to light as we recite the blessings as a community. Join us for Latke Making & Storytime! Yizkor and concluding service followed immediately by a Pot Luck Break the Fast Meal. Bagels, lox, cream cheese, white fish + drinks provided. Please bring a culinary dish to share. Meet at the bridge at the beginning of the Bear Creek trail on Fir Street in Telluride. We'll walk up a part of the Bear Creek trail together and reflect upon ourselves, our community and our world. Meet at the bridge on Fir Street right before the start of the Bear Creek Trail in Telluride. As a community, we will walk over to the falls by the campgrounds and cast our sins (breadcrumbs) into the depths of the water. Bring your own bag lunch for afterwards. Welcome Shabbat with a beer or glass of wine while overlooking the 2017 Blues and Brews Festival in Town Park. Listen to Grammy winner and Rock and Roll Hall of Famer Bonnie Raitt with others from the Telluride Jewish Community. Bring an appetizer/dessert to share. Snow Drift Ranch located at the San Miguel County Line. Directions provided with RSVP. Potluck Dinner - Please bring a dish of your choice, but please NO pork or shellfish, or meat dishes mixed with dairy. Join thousands of Jews around the world celebrate Passover. Help make it happen here in Telluride at Telluride's Community Seder. Contact Michael Saftler at 970.708.5263.